News, views, and items of interest on IBM's Db2 database management system and mainframes. The last time we checked in on our DBAs (the soon-to-retire mentor and his intern) the mentor was schooling his young intern on storage and data retention issues. But there is still much to learn, as our intern will soon find out! "Soon you will get the chance to learn about performance tuning," said the mentor, as he nodded solemnly in his chair. As if on cue, one of the programmers came stumbling into the DBA's cubicle muttering "There's a problem with DB2!" Although learning from past experience is important, most performance problems are not solved on the first try; many performance problems require multiple things to be changed for results to be achieved. It is important, too, to remember the DB2 performance tuning hierarchy. Start with the SQL and application code, because that is where most of the problems reside. Move to the database structures and organization after that. 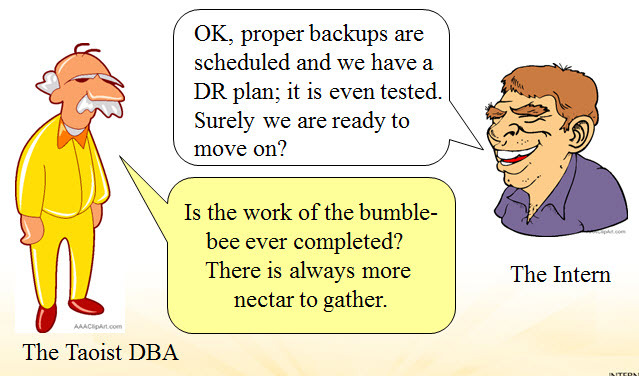 And finally, if the problem has not been isolated yet, move on to the system and DB2 subsystem. Furthermore, tune one thing at a time and test between every change you make! Just then, another visitor comes by stating that things are looking grim in production for the new system. "One of the programs is just taking forever to run! It was very efficient in the test system..."
"Oh, I am sure it was," grinned the experienced DBA as he sent his intern off to check the production access paths. "Hey look, here is a table space scan!" shouted the intern. "Oh, that was there in test, so it can't be the problem, right" questioned the developer. The experienced DBA directed the intern to build a new index and rebind the program and everybody was happy again. The lesson here is that the DB2 optimizer formulates access paths at bind time based on the statistics that measure the amount of data and its make-up. The test system obviously had less data so a scan was not a problem... but more data in production caused performance issues! It is important to build effective SQL that encompasses as many of the “needs” of the application as possible; this eases performance tuning. And as data patterns change and DB2 evolves new features, rebinding the SQL can quickly adapt the program to the data and updates. The intern requested of his teacher, “Teach me all the mysteries of the DB2 Optimizer.” The Taoist DBA replied “A mystery is named such because it cannot be fully understood. Sometimes that which we cannot understand 100% is still well-designed and required. As Heraclitus teaches us 'The unseen design of things is more harmonious than the seen.'" The lesson here is that we can (and should) take the time to understand how the Optimizer works, but we must also understand that nobody (outside of IBM) fully understands every nuance of the optimizer. We can learn general rules, one of which is to entrust the optimizer to create more efficient access than we can write ourselves. Additionally, perform as much work as possible within the SQL and always remember: the DB2 code is more efficient than my/your code! "There is sure a lot to learn here. Even though I've tried to take your lessons to the programmers they continue to blame DB2 for their errors,” lamented the intern. “A monkey chatters until you give it a banana. Then the monkey chatters again tomorrow,” said the experienced DBA. "But that is a bit unfair. Those programmers have a lot on their plate and cannot become as experienced as you will become with DB2. You must exercise patience and wisdom." "So is there more that I need to know about DB2 performance management?" questioned the intern. Craig S. Mullins is a data management strategist, researcher, and consultant. He is president and principal consultant of Mullins Consulting, Inc. and the publisher/editor for The Database Site. Craig has been named by IBM as a Gold Consultant and an IBM Champion for Analytics. He has been named as one of the Top 200 Thought Leaders in Big Data and Analytics by AnalyticsWeek magazine. Craig has over three decades of experience in all facets of database systems development and has worked with Db2 since V1. You may know Craig from his popular books: Db2 Developer's Guide (covering IBM's mainframe RDBMS)... A Guide to Db2 Performance for Application Developers (how to write efficient Db2 programs) and... Database Administration: The Complete Guide to DBA Practices and Procedures (a guide to heterogenous DBA). Are You Heading to Las Vegas for IBM Insight? Digital Transformation and DB2 for z/OS: It’s Not Your Daddy’s DB2! (c) Mullins Consulting, Inc., All Rights Reserved . Awesome Inc. theme. Powered by Blogger.